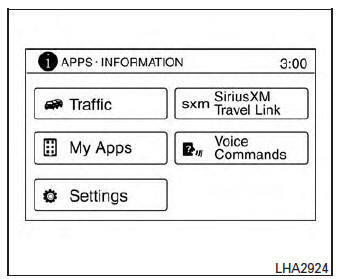 For additional information, refer to the separate Navigation System Owner’s Manual regarding the “SiriusXM® Travel Link”, and “Traffic” features. For additional information, refer to “Nissan- ConnectSM with Mobile Apps” in this section regarding “My Apps” key. 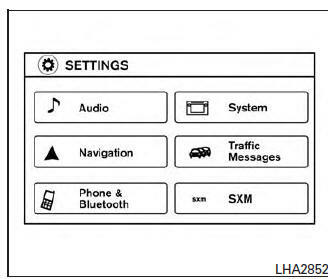 For additional information, refer to “NISSAN Voice Recognition System” in this section regarding the “Voice Commands” key. Audio For additional information, refer to “Audio system” in this section. Navigation For additional information, refer to the separate Navigation System Owner’s Manual. Phone & Bluetooth For additional information, refer to “Bluetooth® Hands-Free Phone System with Navigation System” in this section. System Touch this key to select and/or adjust various functions of this system. A screen with additional options will appear. Brightness Adjusts the brightness of the display. Clock Touch this key to adjust the time. Time Format The clock can be set to 12 hours or 24 hours. Date Format Select from five possible formats of displaying the day, month, and year. Clock Mode Adjust the mode for the clock. “Auto” uses the system’s GPS to automatically maintain the time. “Manual” allows you to set the clock using the “Set Clock Manually” key. Set Clock Manually Adjust the clock manually, Touch the “+” or “-” keys to adjust the hours, minutes, day, month and year up or down. “Clock Mode” must be set to manual for this option to be available. Daylight Savings Time Adjusts the daylight savings time on or off. Language Touch this key to change the language on the display. Camera Touch this key to change the camera settings. Display Mode Touch this key to select the touch-screen display mode (day, night, or automatic). Temperature Unit Touch this key to change the temperature unit being displayed (Fahrenheit or Celsius). System Beeps Toggle the system beep tones feature on or off. When activated, a beep sound will be heard when a pop-up message appears on the screen or a button on the unit (such as the button) is pressed and held for 2 seconds. Return to Factory Settings/ Clear Memory Touch this key to return all settings to default and to clear the memory. Software Licenses Touch this key to display software licensing information. Traffic messages Touch this key to display traffic settings. For additional information, refer to the separate Navigation System Owner’s Manual. SXM Touch this key to start SiriusXM® radio. For additional information, refer to “Audio system” regarding SXM setup in this section. To change the display brightness, press the button. Pressing the button again will change the display to the day or the night display. If no operation is performed within 5 seconds, the display will return to the previous display. Press and hold the button for more than 2 seconds to turn the display off. Press the button again to turn the display on. Press the POWER button to turn audio function on and off. Turn the VOLUME control knob to adjust audio volume. For additional information, refer to “REARVIEW MONITOR”regarding the CAMERA button in this section.